Where is Input Capital's corporate headquarters? Who is Input Capital’s independent auditor? Input’s independent auditor is Deloitte LLP. Regina, Saskatchewan. When is Input Capital’s fiscal year ended? Input’s fiscal year ends on September 30th. On what stock exchange(s) is Input Capital traded and under what symbol? Input shares are publicly traded on the TSX Venture Exchange, under the symbol “INP”. Who is Input Capital’s transfer agent? Contact your broker or our Transfer Agent. Does Input Capital have a direct stock purchase plan? No, Input does not offer a direct stock purchase plan. Does Input Capital pay a dividend on its stock? Yes, Input Capital currently pays an annual dividend of $0.04 per share, paid at the rate of $0.01 per quarter. When is Input Capital’s next earnings release? For timely updates from Input Capital, including earnings release announcements, join our mailing list. Where does Input Capital operate? Input Capital is headquartered in Regina, Saskatchewan. 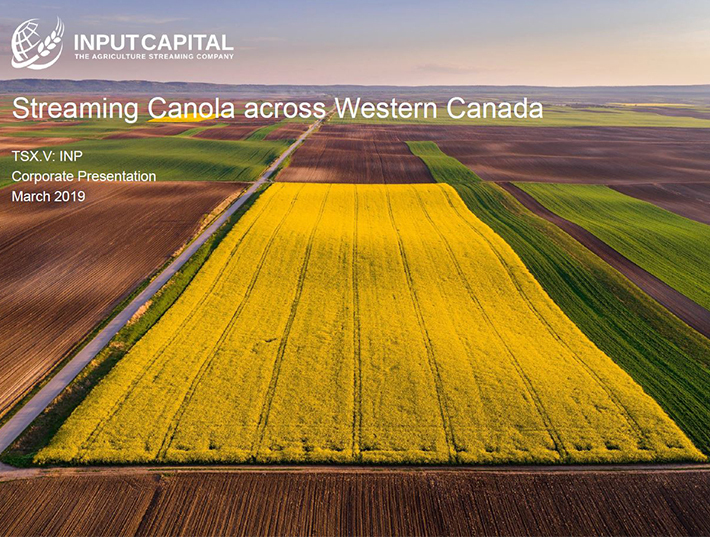 Input currently has contracts with farmers who operate in the Canadian provinces of Saskatchewan, Alberta and Manitoba. Where can I find all of the Regulatory filings for Input Capital? Where can I download and view quarterly and annual reports? Input’s quarterly and annual reports can be viewed on our website and on SEDAR. What is Input Capital’s CUSIP? How do I get added to Input Capital’s email distribution list? Join our email list to be notified about developments at Input Capital Corp. Please send your request, along with your contact information, to ir@inputcapital.com. When and where is Input Capital’s Annual Stockholders' Meeting?